Acceptance and Commitment Therapy (ACT) is the fastest growing therapeutic modality in the world right now, and for very good reason. Unlike almost all other clinical approaches, ACT is a less of a single technique than a comprehensive and flexible framework in which many floating elements can be used. It requires a more creative and experienced therapist, but it can be used very successfully to treat a huge spectrum of the most common complaints that bring people to therapy: mood disorders (anxiety, depression, bipolar), addictions, life directions, grief, and existential crises. When we refer to the encompassing and flexible approach of ACT, one good way to have a sense of this is to consider that CBT (Cognitive Behavioural Therapy) which is the most empirically valid system of therapy, has been often criticized as being rigid and limited. (See my page on CBT here). But in the ACT model, CBT is essentially just one piece of a larger therapeutic strategy that is acknowledged to take care of the cognitive aspects but clearly doesn’t do everything. If you have pain in your body, wouldn’t you want a doctor who would treat every part of you, not just your head? 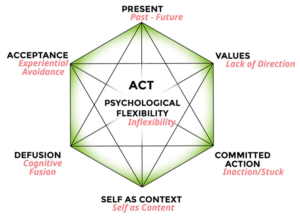 As you can see here, each of the six aspects of ACT flow together and complement each other to help the client out of their particular challenges. A client and therapist can start in any one of these places, depending on the needs and abilities of the client and situation. Clients who keep this model in mind and commit to applying it in their lives can make enormous changes and move past difficulties with increasing ease. It is a real pleasure to see and to facilitate! If you would like to read more about ACT, feel free to check out the Wise Path Blog series on ACT here. The Association for Contextual Science – the best professional online resource for ACT and related theory. The most popular teacher and writer about ACT is Russ Harris – here is his website. The Happiness Trap Online Learning program for those interested in self directed study or can’t afford counselling. The Happiness Trap Book – which I have frequently given out and recommended to clients.